Featuring Ivan Neville&apos;s Dumpstaphunk, The Motet, The Everyone Orchestra, Conehead Buddha, Alan Evans Trio & Many More April 4-6, 2014 At The Hudson Valley Resort In Kerhonkson, NY Kerhonkson, N.Y. - Wicked Cool Productions announces their newest event Rock n Roll Resort v4: "The Dream Machine", an exclusive 3-day, 2-night multi-media experience taking place April 4-6, 2014, at the newly renovated Hudson Valley Resort & Spa in Kerhonkson, New York, nestled within the heart of the Catskills. Rock n Roll Resort is a relatively new, yet familiar experience for festival-goers of any and all ages. Hudson Valley Resort & Spa is an ideal setting - expansive, inviting and intriguing, you will feel right at home inside the grand resort. Funk bands, electronic acts, jam bands, bluegrass, and a little bit of every music genre can be found throughout the event, with music running from early afternoon until well past sunrise the next day. Dance yourself into a frenzy, then walk back to your hotel room to reenergize. You can shop for affordable merchandise from a wide-variety of unique, handmade crafts from the vendors within the event. No matter which direction the end up, you won&apos;t find a dull moment at Rock n Roll Resort. The Rock N Roll Resort v4: "The Dream Machine" confirmed lineup includes: Dumpstaphunk • Motet x2 • Everyone Orchestra • Turkuaz x2 • Cabinet • Conehead Buddha • Peter Prince & The Trama Unit • Nephrok! Allstars • Alan Evans Trio • TAUK • The Alchemystics • The Z3 (A tribute to Frank Zappa) • Leroy Justice • Goosepimp Orchestra • Roots of Creation • Cosmic Dust Bunnies • Mark Mercier Band • BRYAC Funk Allstars • Dr. Westchesterson • Danny Pease and The Regulators • The Kings of Belmont • Mister F • Big Takeover • 7 Below (A tribute to Phish) • The Kind Buds • Michelle Sarah • Rebecca Jean Smith • Business Casual Disco • The Juicy Grapes • The Broadcast • Solaris • Arclite • Darian Cunning Band • The Hornitz • The Big Sway • Positive Mental Trip • Frank Viele • Cheatcode • DJ Adam Amrod • Digital $torm • Political Animals • Space Carnival • Honeycomb • APEL • DJ Icculus • F.A.M. • DJ Nomadic Many artists will take the stage multiple times throughout the weekend, and more artists to confirm soon! 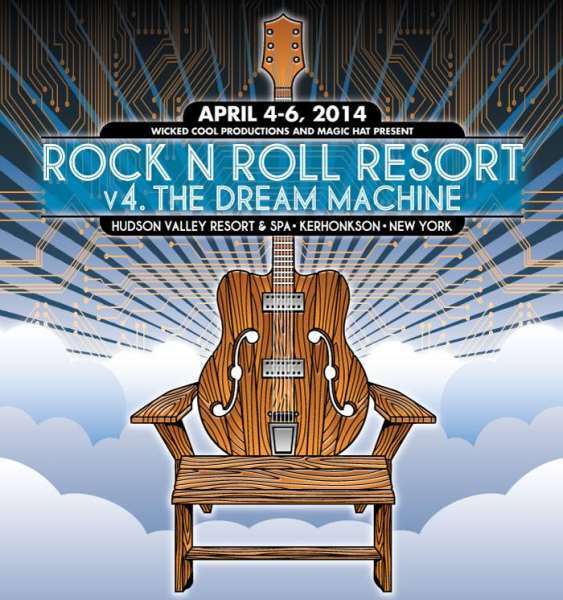 This April&apos;s Rock n Roll v4: "The Dream Machine" will showcase an eclectic mix of up and coming super talent with over 50 hours of musical entertainment, collaborative live art, activities including a disc-golf tournament and mini-golf tournament, workshops and theme nights, cyberistic euphoria, eclectic catering and even a festival vendor row; all at an affordable price and within the conveniences of the Hudson Valley Resort & Spa. Just 90 miles from New York City, the Hudson Valley Resort & Spa is ideally situated in the Shawangunk Mountains. Set within 400 wooded acres adjacent to Minnewaska State Park, and surrounded by gorgeous Catskill views, the ambiance of Hudson Valley Resort & Spa provides an unparallel layer of of tranquility and luxury--a quintessential location for such an incredible musical occasion.